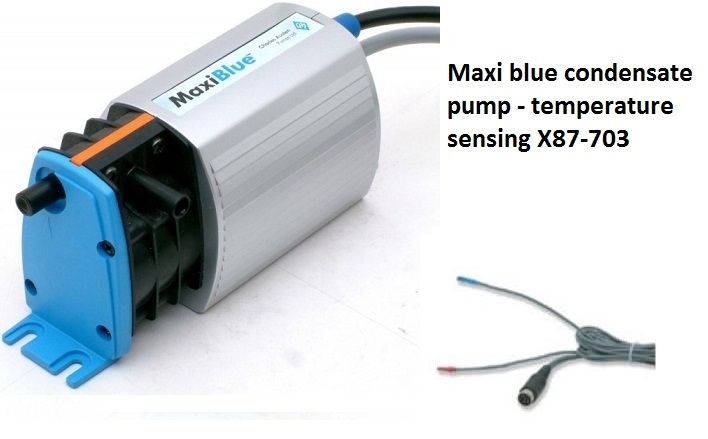 This is the Maxi Blue condensate pump temperature sensing model X87-703 part of the Blue Diamond range. The temperature sensing model uses a 2 wire probe to sense when the air conditioning system is in cooling mode and condensate water is being produced to turn the condensate pump on. The Maxi Blue condensate pump X87-703 uses diaphragm technology for water removal which makes the pump quieter in operation and able to withstand running when dry without damage to the pump.